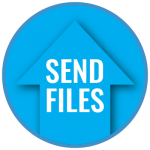 It's time to send us your files. Follow these guidelines and you're golden. Please package all files you are sending together into one zip file before uploading. Files should be high-resolution (300 dpi or more). Include at least 1/8″ bleed for any files that require a bleed. We can accept print-ready PDFs generated from your layout software. We can accept native files from InDesign, Illustrator, and Photoshop. Working files must include all links and fonts. We can also accept native files in Microsoft Publisher, but this is not a preferred format. We DO NOT accept native files generated in any Microsoft Office product or Apple Pages. Text-only documents generated in Microsoft Word are OK. A high-resolution PDF generated from these apps may be acceptable. We will review on a case-by-case basis. Wide-format print files may be uploaded in high-resolution (actual size) JPG, TIF, PDF, or PSD formats. Please convert to one of these formats to ensure best results. These files need to have a resolution of 100 dpi or more. We have worked with 360 Press Solutions for more than five years, and they consistently do outstanding work. Their customer service is phenomenal. They can take your project from an idea to a full, professionally designed campaign and make sure it is perfect from start to finish, on time, and on budget. I highly recommend 360.